NEW TEACHERS MUST READ THROUGH THIS DESCRIPTION IN ORDER TO UNDERSTAND THE VARIOUS ATTRIBUTES OF THE ACE PROGRAM, PRIOR TO FILLING OUT THE APPLICATION AT THE BOTTOM OF IT. Assuming that you have already been in touch with ACE during the "open season"
i.e at the very latest, before the start of October; and have registered and received our confirmation and receipt back, your specified Coin Package will be sent to you generally within 3 - 4 weeks. Distilled water can be used if needed to remove any residue of dirt, this can be shared amongst the class - it does not damage the coin and is available at below one dollar a gallon . You will want to use 1 clean, small, water-tight container per student - plastic film-cans or prescription vials are ideal. In fact, many teachers find that these little containers are the best way for their students to keep their coins - coins have a habit of falling out of envelopes, etc. with regularity (! ), and of course, each container should be labeled with the student's name. Most often all these Optimate coins which we send out will need is either a quick rinse or a quick brush with the toothbrushes, prior to proceeding to identification. Plastic-coated or styrofoam "paper" plates on which to place the coins are useful, since if you drop the coins they can roll into inaccessible corners - and some can prove impossible to retrieve - most ancient coin collectors have had this disaster happen to them! You will need magnifiers (one for every four or five students will be sufficient) and rulers. It is important to note that the object is to retain the "patina" that the years have given the coins and that students should be seriously informed that the coins should NOT, repeat NOT, be brushed back to "shiny"new penny status. As you will see, some features already show clearly and recognizably on the coins, and by using the series of documents entitled "Anatomy of a Roman coin", which are at this site, you will be able to point out the salient points of these coins to your students, so that they will be able to pick out the identifying inscriptions, type of reverse design, etc. Various contests and activities are held during the academic season and details of the contests will be posted at the ACEHelp_Teachers Yahoo group given above for all those teachers taking part in the ACE project. ACE expects that teachers will arrange to take part in as many of these as possible, as they are a vital part of "keeping the ball rolling" and keeping students interested ..... we sincerely hope that, at a minimum, schools will take part in one contest during the academic year. There are a couple of types of ACE contests : the Image Quiz and the Essay contest. Of course, we let the teachers have the answers! Each school which participates has a School Winner who receives a bronze identified Roman coin. The Essay contest needs more explanation and combine ancient coins and ancient history, while encouraging research and creativity within accurate historical background boundaries . The contest is set up to take part initially at a "within the school" level, i.e. the contest will be held within the class/school and judged by the teacher. Coin prizes are awarded by ACE to the winners of these contests. Please note: We ask that all essays for submission to ACE contests be written on a computer, and saved in a standard PC format such as Word or Wordpad files, (Not as .jpg, pdf or other image-file, nor a MAC file) We spent an inordinate amount of time transcribing an earlier year's submissions. The teacher submits his or her " school winner" to the ACE Judges, via email as an attachment. A special reference number for each school is assigned by ACE to identify the entries, to ensure that no regional favoritism can occur. The "Finals" entries are emailed to us, and then posted at a site, where they are judged by the ACE Donor Member Judges. The 1st place winners receive a silver Roman coin each, but even the non-winning entries ( i.e. the "school winners" whose entries are submitted) receive a prepared and identified bronze Roman coin each. For judging purposes, the Finals will be divided into two age level categories, in each of which a winner and runners up will be declared and prizes awarded. PLUS.... at various times there are other contests too which are announced at the ACE Teachers groupsite, including contests for Teachers only - with prizes! Besides the activities detailed above, there are others shown at this URL at our site HERE Then there is our Archaeological Simulation project for which please read THIS ARTICLE for details; and contact us for the Category B and C worn Roman coins which we issue for this project - 100 of these worn but interesting coins are available for $10 incl of S&H to those schools enrolled in the ACE program, who wish to do the "Arch Sim" project. 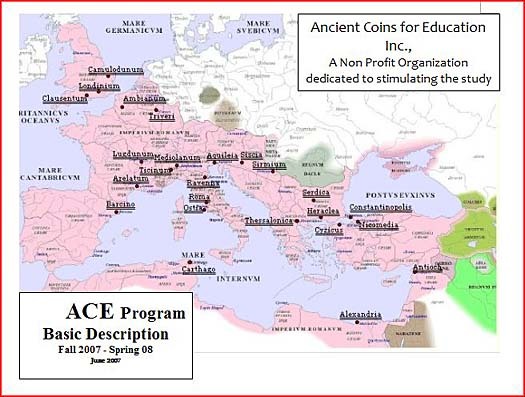 Finally - last but in no way least, as we are very proud of these innovations.....Our veteran (second year onwards) ACE teachers have the option to get our help in setting up their own "School Ancient Coin Museums" - we at ACE donate minimum 6 coins towards this and do our best to get other coins donated by collectors, help with identification, historical background, etc. Souzana Steverding for Ancient Coins for Education Inc.